Sherman High School special needs teacher’s aide Belva Perry holds up a sign Wednesday, Feb. 28, 2018, at the state Capitol in Charleston, W.Va. Thousands of teachers showed up again at the Capitol to voice their frustrations over pay and benefits. What was supposed to be a “cooling off” day Wednesday was anything but under the gold dome in Charleston. After Gov. 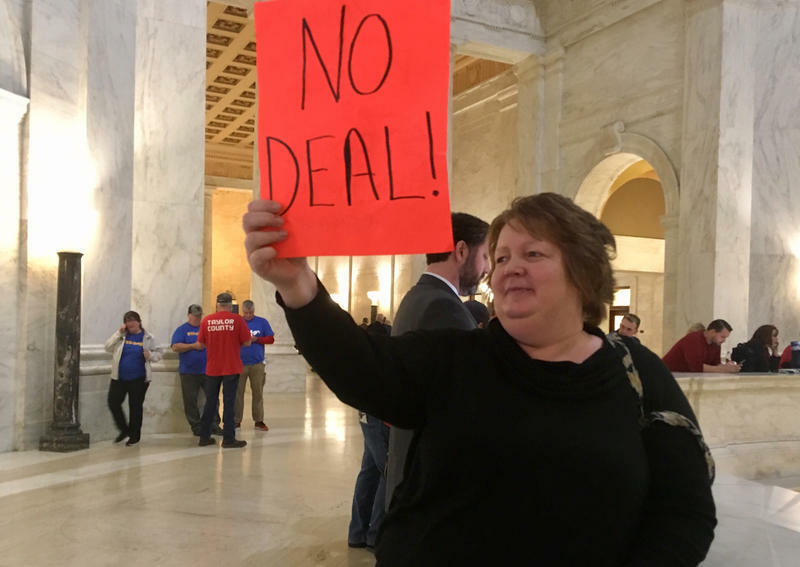 Jim Justice and union leaders announced a deal had been made Tuesday to end the teacher strike and send educators and service personnel back to the classroom Thursday, uncertainty around the Capitol all West Virginia counties called off school Thursday, March 1. Thousands of school employees and their supporters returned to the Capitol Wednesday to demand immediate action on a permanent fix to the health insurance program for state employees and quick action on a proposed pay increase. Both elements -- as well as the promise stop to other legislation that union leaders call “an attack on seniority” and a bill that would force union members to opt-in yearly for deduction of dues on paychecks -- play key roles in their demands in what they call efforts to attract and retain quality educators. Leaders of the American Federation of Teachers-West Virginia, the West Virginia Education Association and the West Virginia School Service Personnel Association met throughout the day Wednesday with Justice’s chief of staff, Mike Hall, who said around midday that the governor would not be at the Capitol. County-level union leaders met with members throughout the day to decide next steps. According to a state Department of Education website that announces school closings and delays, most counties have called off completely while others are on a delay. The closings came after state superintendent of schools Dr. Steven Paine issued a statement around 4 p.m., indicating that the mood around the Capitol had come to his attention. “My expectation is that all public schools in West Virginia will be in session on Thursday, March 1, 2018,” he said in the statement. By Wednesday afternoon, Gov. Justice had notified both the House and Senate that he had raised revenue estimates for the 2018-19 fiscal year by $58 million. The House Finance Committee took up and amended a committee substitute for House Bill 4145, which now gives teachers, school service personnel and state troopers a 5 percent pay increase this year. Chief of staff Hall said a pay increase for all state employees is still in the works, and will be addressed in a budget bill -- with each agency’s personnel line item to be increased by 3 percent. That plan would have to be addressed by the Legislature. House Bill 4145 would supersede Senate Bill 267, a law signed by Gov. Justice that called for 4 percent raise over three years for teachers, as well as a 2 percent raise this year for service personnel and state police -- with an additional 1 percent hike next year. Union leaders gathered in front of members of the media and a few dozen members of their respective organizations in the Governor’s Cabinet Conference Room once the bill had cleared the committee. “We believe the best course of action at this time is to return to school tomorrow. Now we realize that not everyone will,” West Virginia Education Association president Dale Lee said at the news conference. Angie Steffy, who teaches at Woodrow Wilson High School in Raleigh County was in the room during the announcement of legislative progress and the urging of union leaders to head back to the classroom if called upon by county superintendents. “Right now, coming out of that room I'm satisfied at this point. But, I'm holding out until I see what the Senate does with that vote,” Steffy said, referring to House Bill 4145. By the time Steffy had spoken to media, Raleigh County hadn’t yet called off school for Thursday. While she said she would return if schools had been open, she said she doesn’t rule out the possibility of another walkout once they go back -- hoping for even more progress, and soon. With Wednesday being Day 50 -- known as “crossover day” -- the pay raise bill in the House needed to clear the chamber by the end of the day to still be in play. With that known, the House suspended constitutional rules calling for bills to be read three times on three consecutive days and put House Bill 4145 up for a vote. The bill passed 98-1, with Del. Saira Blair, a Republican, being the only one to vote in opposition. Blair, who once held the title of the youngest legislator in the country, is not running for re-election this year. Across the rotunda, Senate President Mitch Carmichael -- who has remained skeptical of the front-loaded pay increases announced in the deal made by Gov. Justice and union leaders -- said the process appears to be moving too quickly. Asked about union leaders’ confidence that House Bill 4145 will pass the Senate, Carmichael said he has yet to begin counting votes. However, many who have walked off the job in recent days say a permanent fix to healthcare for public employees remains the biggest priority. Gov. Justice announced he had signed an executive order creating a task force to study the program as a means to quell rising costs to the program. Appointees will include active and retired public employees, representatives of the teacher and service personnel unions, experts on the insurance business and members of the Legislature. Two Republicans and one Democrat from each chamber will serve on the task force. Lee said it’s good that members of the Legislature will be on the task force. “You have to have members of the House and Senate on the task force because, ultimately, they’re the ones who are going to be passing any conclusions or any recommendations that the task force makes,” he said. But even with action on pay raises and PEIA, school closures and delays came rolling in throughout the evening. Some teachers who continued to mill about the Capitol late on Wednesday said they remain uncertain and plan to stay off the job indefinitely.